Our services cover all areas of financial management, from investment and retirement planning, to risk management strategies and issues surrounding estate planning strategies. 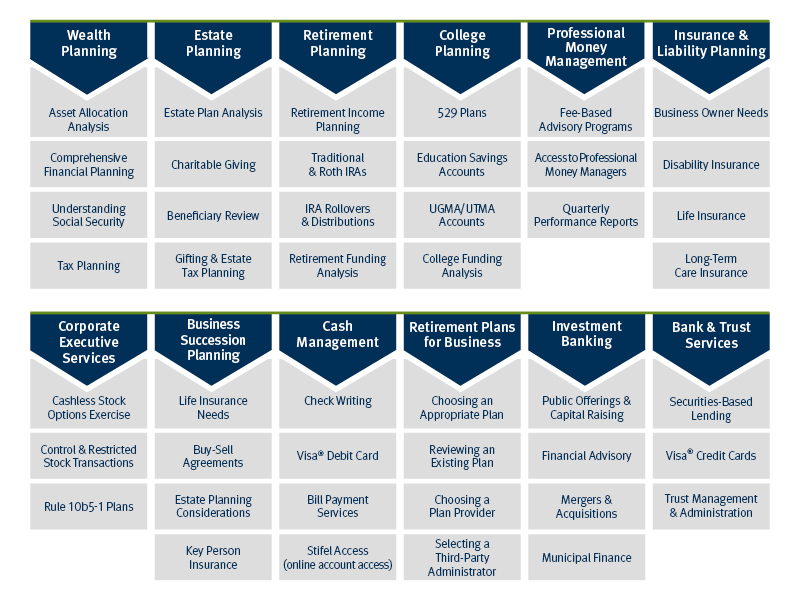 We specialize in helping our clients develop a comprehensive, cohesive financial strategy that fits their unique needs and enables them to pursue both short- and long-term strategies. Lending services for clients of Stifel, Nicolaus & Company, Incorporated are performed exclusively by Stifel Bank and Stifel Bank & Trust (Stifel Banks). Stifel Bank, Member FDIC, Equal Housing Lender, NMLS# 451163, is affiliated with Stifel Bank & Trust, Member FDIC, Equal Housing Lender, NMLS# 375103, and Stifel, Nicolaus & Company, Incorporated, Member SIPC & NYSE, each a wholly owned subsidiary of Stifel Financial Corp. Unless otherwise specified, references to Stifel may mean Stifel Financial Corp. and/or any of its subsidiaries. Unless otherwise specified, products purchased from or held by Stifel are not insured by the FDIC, are not deposits or other obligations of Stifel Banks, are not guaranteed by Stifel Banks, and are subject to investment risk, including possible loss of the principal. Speak with your Financial Advisor about your risk tolerance level, market fluctuations, and specifically the potential risks associated with a Stifel SPA Line of Credit. The SPA Line of Credit is a demand loan using the assets in the account as collateral. If the minimum required value of the collateral is not maintained, the account holder will be required to: (1) post additional qualified collateral, (2) repay a portion or all of the debt, or (3) forfeit that shortfall in value of pledged assets to Stifel Bank & Trust. If the call is not met, Stifel Bank & Trust can liquidate some or all of the assets in the SPA Loan Account. If terms of the account are not maintained, Stifel Bank & Trust may call the loan due and payable. Stifel Bank & Trust will attempt to communicate with you to determine the right course of action to alleviate a collateral shortfall. Stifel Bank & Trust has the right to sell securities as needed without your consent to meet a collateral call. Trust and fiduciary services are provided by Stifel Trust Company, N.A. and Stifel Trust Company Delaware, N.A. (Stifel Trust Companies), wholly owned subsidiaries of Stifel Financial Corp. and affiliates of Stifel, Nicolaus & Company, Incorporated, Member SIPC & NYSE. Unless otherwise specified, products purchased from or held by Stifel Trust Companies are not insured by the FDIC or any other government agency, are not deposits or other obligations of Stifel Trust Companies, are not guaranteed by Stifel Trust Companies, and are subject to investment risks, including possible loss of the principal invested. Stifel Trust Companies do not provide legal or tax advice.